1. Line a cookie sheet with aluminum foil and spray the foil with cooking spray. 2. Poke Popsicle sticks or cinnamon sticks through the top of firm applies. Place the apples on the cookie sheet. standing upright with sticks pointing up in the air. 3. Place the ingredients listed above (not the optional toppings) in a saucepan. Cook over medium-high heat. Stir to dissolve the sugar. Bring the mixture to a boil. Don’t stir the sugar mixture once it begins to boil, to avoid crystallizing the candy. Use a pastry brush to brush the sides of the pot with warm water, to prevent crystals from forming. Simmer until the candy reaches 290 degrees Fahrenheit. Remove the candy from heat when it’s at 290 degrees Fahrenheit. 4. When the candy mixture is ready, work quickly to coat the apples, before it hardens. 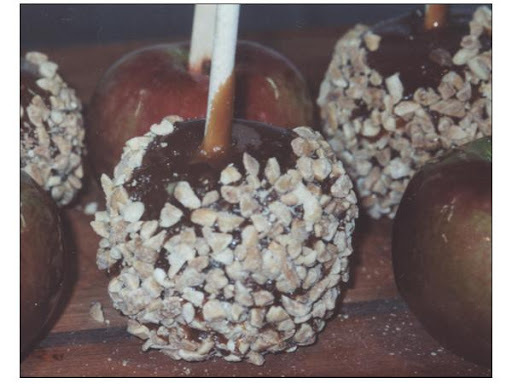 Dip your apples, holding the wooden stick, and submerge completely in the candy. Tilt the pot as necessary and spoon candy over the apples for full coating. 5. Roll the apples in candy or nut coating before the candy shell hardens. 6. Place apples on the cookie sheet. When all your apples are covered, place them in the refrigerator to cool. What’s your favorite Halloween treat to make with children? I have done this with caramel since I am intimidated by this candy coating method of cooking.Also, I let kids spread peanut butter on the apple and roll it in toppings.